Russian President Dmitri Medvedev tried to soothe Russia’s falling stock market, while taking a jab at the United States. 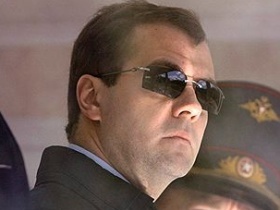 As the RIA Novosti news agency reports, Medvedev was speaking at a meeting with Vladimir Milovidov, the head of the Federal Financial Markets Service (transcript). Russia’s two major indexes, the RTS and MICEX, have taken a tumble in recent weeks, and closed for the day at more than two-year lows. “These are not the easiest times for the stock market,” Medvedev said. “Unfortunately, there are objective reasons for this situation that lie beyond the power of our financial authorities and are not related to economic factors in our own country. Medvedev has previously accused the US of initiating a global economic crisis. In June, Medvedev spoke at the World Economic Forum in St. Petersburg (video). He explained that the huge role of the US in the world economy was one of the major reasons for what he said may be the worst economic crises since the Great Depression.